I got so many in-person comments about this post, I thought I'd give it to you again. For those of you who haven't tried this recipe, try it. Tonight. It's summer. Which means that I'm watching an inordinate amount of Food Network lately. I know, I shouldn't be, and the guilt is killing me, but I figure since my family benefits from some additional Food Network viewing, I shouldn't feel too guilty about it. Right? Like tonight. Boy, did they benefit. 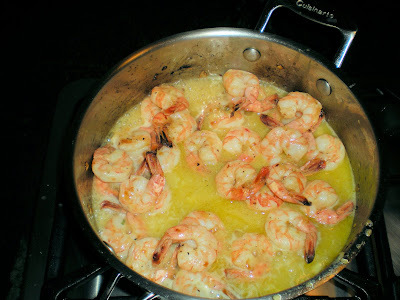 See, I watched Tyler Florence make Shrimp Scampi the other day and I thought to myself, "Gee, that looks easy. And boy does my family love shrimp. I'm going to try that one!" So tonight I tried it, and my family loved it. You should try it too because it really is so easy. Cook about a pound of linguini (I don't have to spell that one out for you, do I?). 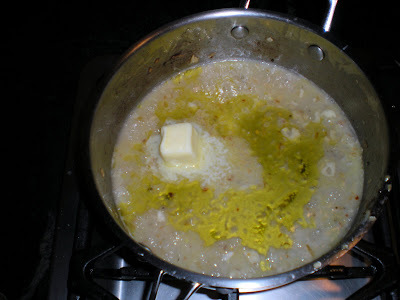 Melt two tablespoons of butter with two tablespoons of olive oil. Add shallots, garlic, and a pinch of red pepper flakes (unless you're Kate and you add several pinches because good golly nothing could be hot enough for that girl). Now, I have to just stop here and say this is the one and only time I modified Tyler's recipe. He puts five . . . yes, FIVE . . . cloves of garlic in his recipe. I know, I know, it is shrimp scampi after all, but seriously . . . five?? I love my family, so I cut back on the garlic just a bit. After a couple of minutes, add the shrimp and cook it for about three minutes until it's pink. Remove the shrimp from the pan, but return the pan to the heat. Add some wine and lemon juice and bring that to a boil. Add some more butter and olive oil (I told you it was good, right?!). Return the shrimp to the pan and cook for another minute or so, just to let all that deliciousness come together. Add to the linguini, sprinkle with parsley, and voila! Instant yummy supper! 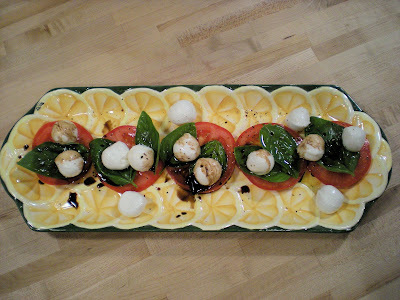 And just because I had some leftover tomatoes and fresh mozzarella, and just because I happen to grow basil on my patio every summer, I threw together a nice caprese salad to go with it. Oh my it was good! 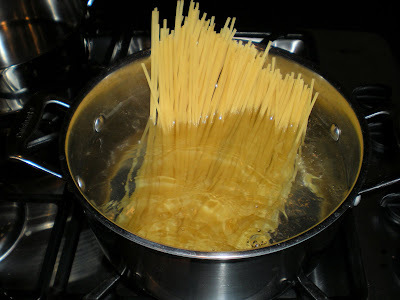 For the pasta, put a large pot of water on the stove to boil. When it has come to the boil, add a couple of tablespoons of salt and the linguini. After the water returns to a boil, cook for about 6-8 minutes or until the pasta is not quite done. Drain the pasta, reserving 1 C. of water. 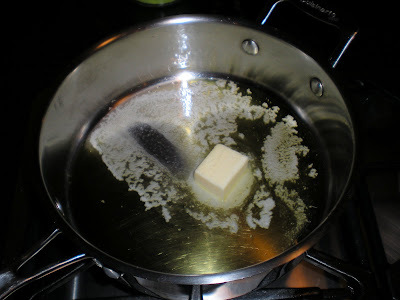 Meanwhile, in a large skillet, melt 2 T. butter in 2 T olive oil over medium-high heat. 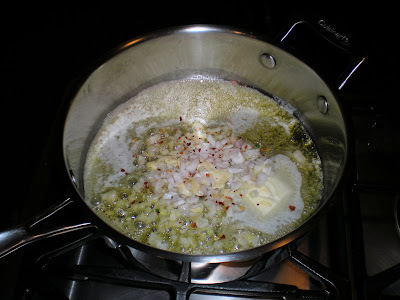 Saute the shallots, garlic, and red pepper flakes until the shallots are translucent, about 3 to 4 minutes. Season the shrimp with salt and pepper; add them to the pan and cook until they have turned pink, about 2-3 minutes. 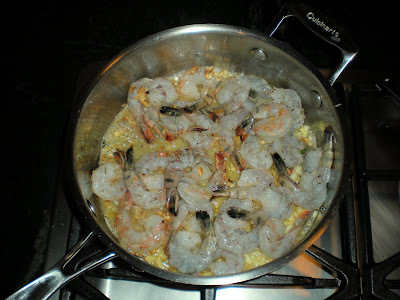 Remove the shrimp from the pan; set aside and keep warm. Add wine and lemon juice and bring to a boil. Add 2 T. butter and 2 T. oil. 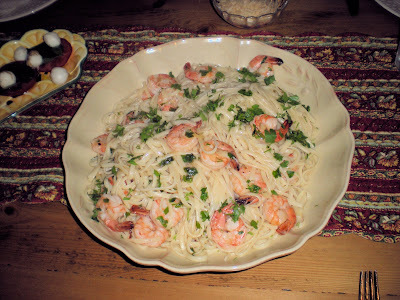 When the butter has melted, return the shrimp to the pan along with the parsley and cooked pasta and reserved pasta water. Stir well and season with salt and pepper. Drizzle over a bit more olive oil and serve immediately.